This Prairie has a true Southwestern feel! Custom paint and touches throughout. Kitchen has staggered maple cabinets, Granite countertops, & Stainless steel appliances including side by side refrigerator & Bosch dishwasher. Saltillo tile throughout - no carpet! Guest bathroom has custom vanity and copper sink. 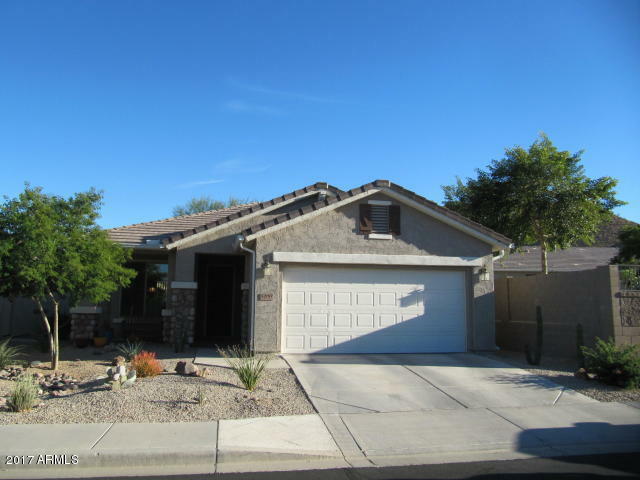 Master bath with granite countertops and bedroom has exit to tiled back patio extended with pavers and pergola. Enjoy the beautifully landscaped backyard with mountain and golf views. 2 car garage is extended & has custom cabinets w/work bench & is fully insulated in the ceiling & walls. Click on the photos tab to see inside the home, community center & virtual tour. Document tab has additional home upgrades & floorplan. Solera is a 55+, gated, community with lots of activities.